Don't You Just Love These Bathrooms? Looking for manageable ideas? This photo gallery features ones that we would love to do ourselves. Most lean heavily on basic elements, but towards the end of the gallery we see some fancier bathrooms with frameless glass showers and designer tile. Pictured, this bathroom idea is, really, just all about paint. It's Valspar Cassias on the bottom, Globe Thistle on top, with everything divided by Craft White. Add in a pedestal sink, wood windows, and medicine chests for a traditional look. If you want to style your bathroom along the traditional lines, Rejuvenation is the online place to go. I've bought stuff from them and have always been pleased. Here, a pair of electric wall bracket lights is on either side of their Mendenhall medicine cabinet. And the pedestal sink, subway tiles, and cast-iron tub complete the picture of a classic antique (but modern and functional) bathroom. To duplicate the look of bathrooms in the first half of the 20th century, a great resource is Rejuvenation Hardware. In fact, below I've included the link to their bathroom settings gallery. The Mission-style bathroom is ever-popular for its clean and simple lines. It's also relatively easy and inexpensive to duplicate for your own home. Who needs two pedestal sinks? Apparently, the owners of this cottage do. And they'll always be able to distinguish the "his" and "hers" sinks because, as you may note, the basin of each sink is different. That anomaly aside, it's a soft and gracious cottage-style bathroom renovation idea. To emphasize that easy feeling, the beadboard continues all the way up the walls (beadboard tends to stop around 48" high). The beadboard paint is Valspar's Winddrift. When considering various bathroom renovation ideas, lighting plays a major role. One problem with pedestal sinks is you're typically limited to wall bracket lights on either side of the mirror. Or the quick-and-dirty lightbar. Kichler Lighting solves this problem by ingeniously combining a three-bulb light bar across the top, with two dangling pendants on either side. It's a far less harsh light than traditional arrangements. Plus, it's an easy install because you don't have to wire two separate bracket lights: everything comes out of that single lightbar. If you're looking for the short and direct path to a Craftsman-style bathroom renovation, it doesn't get much easier than Portland, OR-based (yet still online) Rejuvenation Hardware. Here's a bathroom renovation idea that features their popular Mendenhall medicine cabinet and Umpqua wall sconce lights. You've got peach. Specifically, Valspar's Peach Taffy, with the window sash painted La Fonda Flamenco Pink. Other than all this peach, this is a bathroom renovation idea that keeps it simple: glass vessel sink elevated on a custom-built pedestal; oval mirror; and a few pendant lights. Easy-flowing contemporary lines in this bathroom renovation idea, using Kichler Lighting's Montara collection. And nothing can get more contemporary than vessel sinks and glass bricks. This comes from Rejuvenation Hardware and is meant to highlight their stylish La Grande wall bracket lights. But you can also see the beautiful mirror, unusual pedestal sink, and highly distinctive wall-covering below the chair rail that looks, to me, a lot like tin ceiling panels. Most bathroom renovation ideas tend to leave...ladders out of the scheme. But this one, from Valspar, tosses a ladder into the mix, and why not? It's highly functional as a towel rack. And painted Valspar's Ultra White, it chimes nicely with the Bluer Than Blue (yes, that's the name) wall paint. You'll also find high 5 1/4" baseboards and wide window trim in the same color. A pedestal sink completes this picture of a traditional bathroom. Small bathrooms don't have to be unstylish and dour. Whatever you do to large bathrooms can be done to smaller bathrooms, just on a reduced scale. Case in point is this lovely design for a small bathroom from premium tile retailer Bedrosian's. The impression of wide-open space comes from the tall, angled ceiling, pouring natural light into the space. 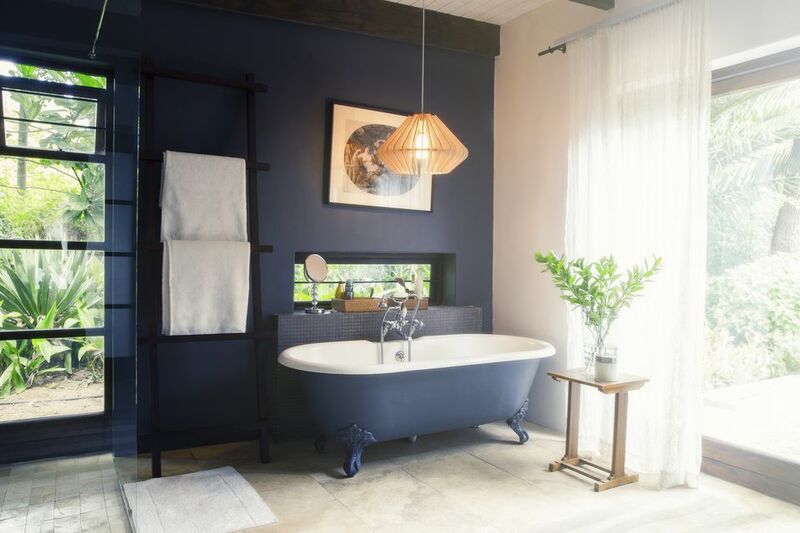 The gem and focal point of the bathroom is the freestanding bathtub. Tile is from Bedrosian's Matrix collection. Just Look At The Stone and Tile In This Wintertime Bathroom! Stay warm even when it's snowing outside while tucking into a nice, hot bath in this massive soaking tub. The floor-to-ceiling window brings in all of the natural light you could want. Trendsetting stainless steel tub fixtures mean this is a truly modern bathroom. But what really makes this bathroom unique is the liberal usage of glazed color body porcelain tile on both the tub and the walls. All tile is from Bedrosian's. You've gotta have a big bathroom for this one. It's called decking. The smaller the total space, the smaller the tub area. In most bathrooms, this means squeezing the tub into an alcove area. Result: no deck at all. With a generously spaced bathroom area, though, you have room to create a large deck in which the tub is set. The deck is no longer an adjunct to the bathroom but a major feature, a place to put your drink or coffee mug or magazines; a splash zone; a place to sit; storage for towels. The floor is tiled in massive 24" x 24" Bronze Allure from Bedrosian's. Go for the bold with this in-your-face bathroom, featuring acres of glazed porcelain marble-look wall and floor tiles. Of-the-moment elements include: unique white post-modern chandelier and cast-metal elk horn fixture. Tile is from Bedrosian's: Calacatta. Once again, it's your dream bathroom, resplendent with an angular freestanding tub perched front-and-center, frameless glass shower, and Corinthian white honed field tile, 12" by 24" (Bedrosian's). Add wooden doors with opaque glass to bring in natural light but protect privacy. From Mission Stone & Tile... Don't you just love this elegantly remodeled bathroom, found in a pre-war Manhattan condominium? The large honed and polished 8" Oriental White hexagonal tile on the back wall honors the 20th-century urban tradition of tiling floors in hexagonal and octagonal tile. The frameless glass shower makes this a decidedly modern bathroom, though. Traditional is maintained at this remodeled bathroom, just on the edge of New York City's Chelsea neighborhood. Tile from Mission Stone & Tile graces this pristine bathroom and its classic pedestal sink and modern frameless glass shower. Tile for this floor is called Kaliedostone Mosaic. How many bathrooms have round tiles? Octagonal? Yep. Hex? Lots do. But round tiles are rare. ModDotz are the signature product of ModWalls. These penny-sized tiles come in 12" square mesh-mounted sheets. "Rounding off" this very modern bathroom are a natural wood counter, vessel sink, and sconce lights that have a touch of an Art Deco feel to them. Typical bathroom tile: white subway tile (3" x 6"), glass mosaic, or four-inch tile. This is not typical. It's called Aura, and it's from one of my favorite tile purveyors, Ann Sacks. Swirly and mysterious, this green and blue tile is the perfect complement to the severity of the angular sink. The bright glass-and-white classic bathroom remodels seen in our earlier pictures have a cousin. But where those were sharp and shrill, this one is cool and mellow. Employing 2" x 16" dark brown tile from Ann Sacks as a wall field tile, this elegant remodel maintains traditional overtones with the standalone sink, sconce lights beside the mirror, medicine chest, and chrome fixtures.